The Saronic group of islands are all within an hour or two of Piraeus by boat, making them ideal destinations for day trips from the city for those who want to experience a taste of Greek island life. Alternatively, visitors can use the islands as tranquil bases on which to stay while commuting to Athens to see the sights. Aegina is the closest island, sporting a sandy beach called Agia Marina, and a quaint fishing village called Perdika. Hydra has no sandy beaches, but the town is picturesque and offers good seafood restaurants. 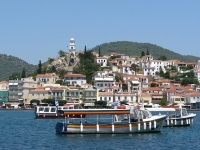 Poros can be reached from Piraeus in little more than an hour and sports beautiful forests that descend to the beach. It offers watersports opportunities and a lively café scene, as well as being a ferry hub offering connections to all the popular Aegean islands. Spetsi has an attractive old harbour and one of the oldest wooden boat-building yards in Greece. It is also renowned for its beaches and pine forests. Piraeus port may be a little confusing or overwhelming at first but it is also exciting and the boat trips to the islands are usually wonderful experiences in themselves: most of the tourist boats use the Zea Limani section of the port.